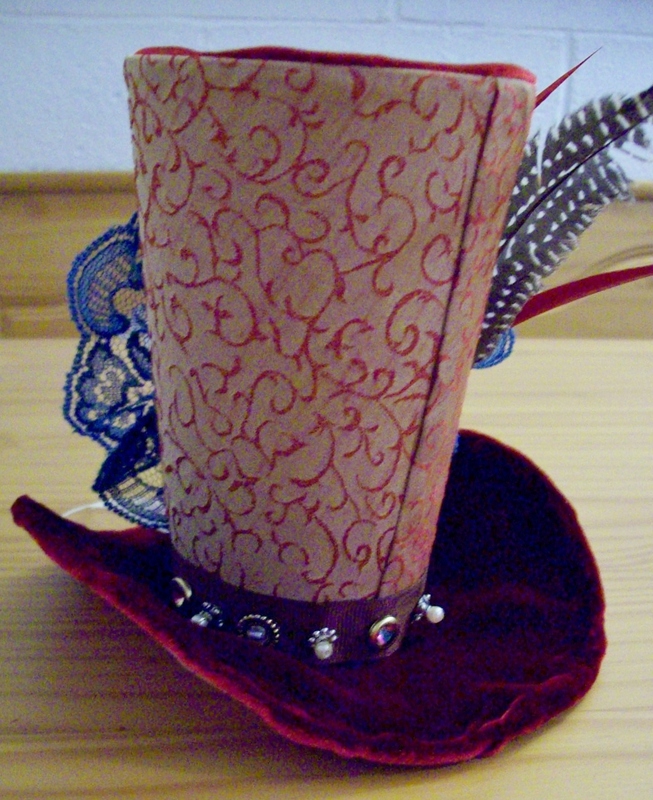 As promised, here’s the step-by-step to my mini steampunk tophat! I looked at several different tutorials (check out threadbanger.com for a great start,) then made my own frankentutorial based on supplies I already had to make my hat. 1.) Take your plastic cup and place it upside down on your piece of foam board or cardboard. Trace the opening of the cup onto the board, then cut out on the inside of the line you just drew. The idea is for the round piece to fit snugly in the opening of the cup after both the cup and the circle are covered in fabric. 2.) Place your circle on the fabric of your choice. (I chose velvet to coordinate with the gold and red silk I used for the tall part of my hat.) Trace the circle onto your fabric, then draw another circle about an inch out from the original circle onto your fabric. 3.) Cut slits in your circle from the outside edge nearly to the edge of the inside circle you traced. Cut several slits around the circle so that your fabric will lay flat when you cover your circle. 5.) Place your plastic cup on its side on top of the “wrong” side of the fabric of your choice. (Be sure there’s enough fabric so that you have at least an inch of overlap at the top and bottom of your cup. Place a short line of hot glue on the top and bottom edges of the cup (the opening and the base of the cup,) and begin to roll your cup onto the back side of the fabric. Repeat until you’ve rolled the cup all the way around, at which point the sides of the cup should be covered in fabric. Again, go slowly, making sure your glue adheres, and tighten the fabric so that it lays flat on your cup. 6.) When you’ve covered the cup, cut a straight line at the end of your fabric, and fold it over to create a seam. Glue the fabric seam down, then glue the neat edge of your fabric onto the cup. 7.) Using the same technique you used to cover your foam board/cardboard circle, cut slits in the fabric that overlaps the top and bottom of your cup. Glue the tabs you create inside the cup, and onto the bottom of the cup. 8.) Quickly create a ring of glue about 1/2 inch inside the opening of your cup, and place your covered foam board/cardboard circle inside to secure. The base for your tophat is finished. 9.) Stand your cup upright, and, taking your wire, create a circle around the base, at least a few inches out from the edge of the cup. This will be the base for the brim of your hat, so you can make it as small or as large as you like. Cut the wire with about 1/2 inch to spare when you’ve found the right length. 10.) Overlap the two ends of your wire and connect by covering with electric or masking tape to create a circle. Try not to get too bulky with your tape, since you’ll be covering the wire with fabric. 11.) Using the same technique you used to cover your foam board/cardboard circle, trace a circle around your wire about 1/2 inch from the edge of the wire. You may or may not need to cut slits in your fabric for this step, since you’ll be gluing your fabric directly to the edge of the wire. Glue your fabric down and cut off any excess fabric around the inside edge. 12.) To attach your brim to your hat, apply a liberal amount of glue around the edge of the bottom of your cup, and place in the center of the finished side of your circular brim. (The side without raw fabric edges showing.) Now stitch the fabric to the bottom of the cup. This doesn’t have to look pretty – you’ll finish your brim and hide any stitches you make. 14.) Cut another circle of fabric, this time the same size as your wire circle, to cover the unfinished side of your brim. You can either fold the edges of this fabric over and glue down to creat a seam, or just glue the circle down, raw edges and all, then cover the edge by gluing down a pretty trim. Your brim is finished. 15.) Bend the wire of your brim any way you like to create an authentic tophat look. 17.) Now you can add your embellishments! You can add feathers by cutting them to the desired length, then taping together and gluing onto the hat. Metal buttons and beads, gears, and pretty baubles can be stitched onto your ribbon and glued around the bottom of your tophat to hide the tape on your feathers. I created a pretty lace pinwheel by cutting a length of lace ribbon, then making a running stich along the edge to pull and gather the lace. Using a matching thread, stitch the raw edges of the lace together to create a circle, and sew a button in the center to finish. I also added some organza ribbon to give the illusion of a prize ribbon. You can get really creative here, adding any kind of embellishments you choose. Just be careful not to make the hat too heavy! Back view of the hat. 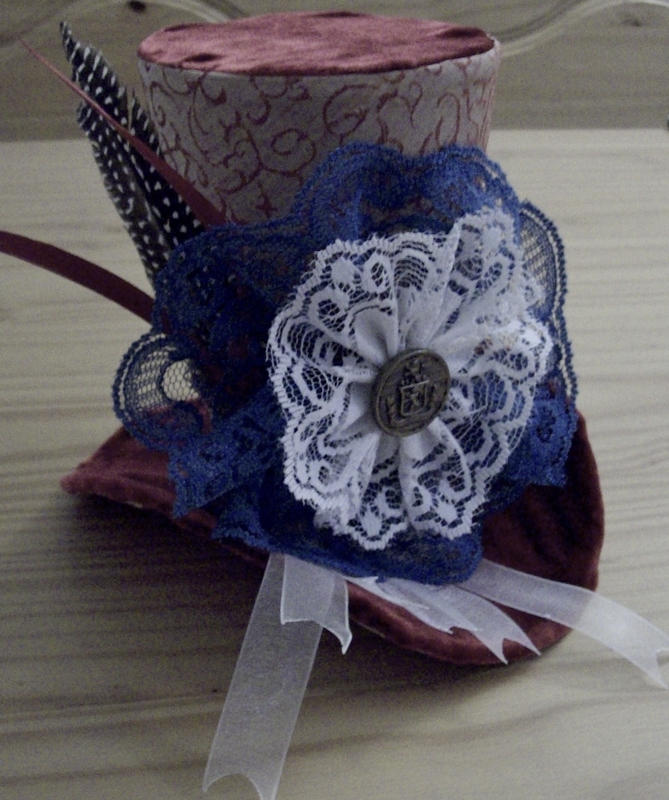 Notice the "seam" and various trinkets sewn to the ribbon. Now, wear your hat with steampunk pride! Stay tuned for more fun and simple steampunk tutorials.